Bitdefender one of the best anti virus software in the world. Bitdefender Internet security is a capable product from bitdefender.this all-in-one security suite delivers comprehensive proactive against the latest virus,spyware and online identity theft any easy-to-use. Bit Defender Internet security is shareware security type software for windows-based computers that give complete protection to avoid all threats that may enter or harm computer system. this Internet security suite protects computer and personal; information from threats such as Trojan key loggers,browser hijackers and ad ware.it stops unauthorised attempts to very user's system files and registry keys. BitDefender Internet security can encrypt all IM chats that efficiently help avoiding spam massages.it also protects the systems phising so that user's important information and identify is safe from scams. Bit defender Internet security contains parental controls that filters websites and applies restrictions to children. By this, user can what sites to bock,massages and emails that may contain flagged worlds. it also has Wi-Fi monitoring feature that protects computer from unauthorised access attempt. 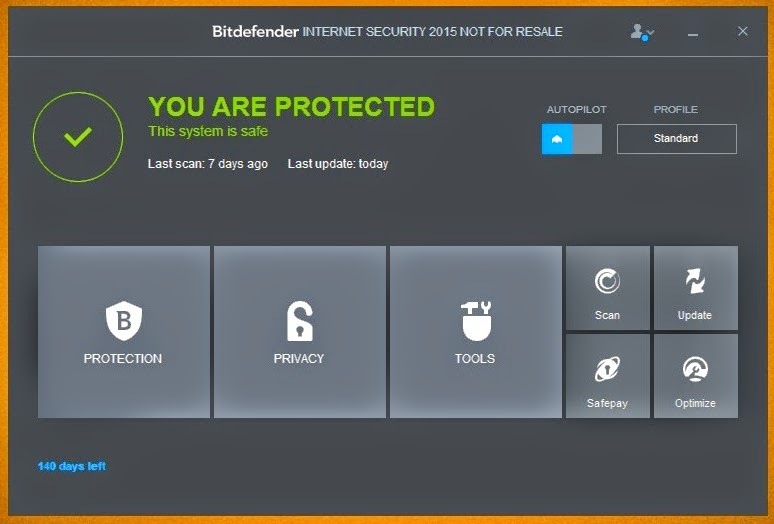 New features of Bitdefender Internet security 2015. Start up Optimized- This tool allows you to disable or delay any app from your start ups,thereby helping you to increase windows start up speed. One click Optimized - This tool frees up the space in your system by removes unnecessary files. PC clean up Wizard- This feature helps users to clean up the browser cache, Windows juke files, memory dumps in the system, and error reporting files. Registry cleaner- This tool help user to clean the specific areas in system. Duplicate files remover- This tool detect the duplicate file in system and removes than creating more of space.